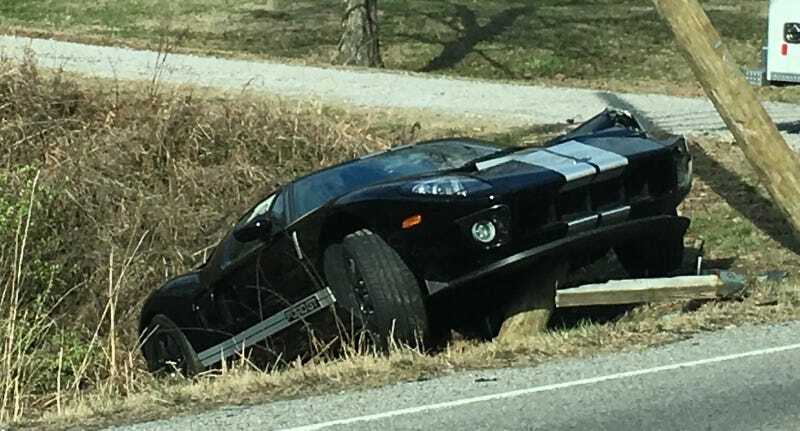 A tipster sent in some pictures of a 2005 or 2006 Ford GT getting towed out of a ditch, and I just kind of stared at them for awhile pondering the cruelty of this universe and the perverse need for me to write about such things. This really isn’t good. Car crashes are never good! But this, this was a Ford GT. Black, with silver stripe. Definitely expensive, you know, and even though Ford GT owners could probably afford the insurance rates and repairs and other monetary things like that, it’s never good for somebody who appreciates the machinery, in its original, un-abused form to see such trauma inflicted on such a beautiful car. According to the friendly person who sent in the pictures, the GT’s driver was going too quick around a corner and hit a pole. Looking at the pictures, the damage doesn’t seem too bad, but it was right in the face! The face! And we don’t even really get a good look at the side that’s damaged. You just get a hint. A hint of the pain. I’d like to think I’d be more careful driving my Ford GT. Not baby it, but, I don’t know, try not to fool around too much. Just enjoy the moments. The aroma of pre-recession American supercar-dom. The note of the V8. And I’d soak up its heat through the back of the seat. Really connect with the mechanics of the manual shifter; the antagonizing clinks. But there would probably come a day where I would push it. This is nice—no, this feeling is great! But what if there’s more? What if I’m missing out on something, or maybe we’re ready to go a little harder. Wow! What I have been missing! And then the moment would come, traction lost, momentary panic and numbness among a cacophony of terrifying sounds of ripping metal and the forces pushing, and then pulling. And then nothing. I can’t imagine the feeling in that moment. The hesitation to get out and check what happened. The pole, mocking me, right there just feet away from where I now sit in my shame. And the crash also reportedly knocked the power out all down the street. So much suffering! I feel like I’ve still got some more thinking to do, but thanks for sending in the pictures.